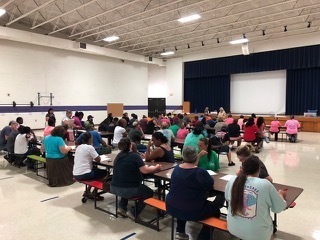 Ripley Primary School’s Pre-K parents attended the Carl Perkins Family Child Abuse Prevention Training Class Tuesday, August 21, 2018. Ms. Annette Maxwell director of the Carl Perkins center presented parents information on how to identify child abuse and the proper ways to report it. There were approximately 65 parents in attendance. To show appreciation, the parents were given a dress code pass for their child to use on Wednesday, August 22, 2018. A huge THANK YOU to those who attended making it the largest number of parents in attendance since the Pre-K program began. We know with this type of commitment from parents and community that our students and teachers will have a fantastic Pre-K experience this year!